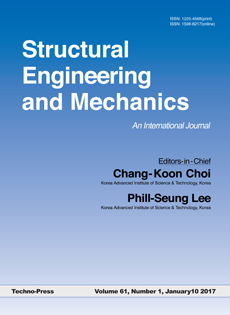 The STRUCTURAL ENGINEERING AND MECHANICS, An International Journal, aims at: □ providing a major publication channel for structural engineering, □ wider distribution at more affordable subscription rates; □ faster reviewing and publication for manuscripts submitted; and □ a broad scope for wider participation. AI Application and Expert Systems in Structural Engineering. Submission of papers from practicing engineers is particularly encouraged. A reinforced concrete (RC) framed structure detailed according to non-seismic detailing provisions as per Indian Standard was tested on shake table under dynamic loads. The structure had 3 main storeys and an additional storey to simulate the footing to plinth level. In plan the structure was symmetric with 2 bays in each direction. In order to optimize the information obtained from the tests, tests were planned in three different stages. In the first stage, tests were done with masonry infill panels in one direction to obtain information on the stiffness increase due to addition of infill panels. In second stage, the infills were removed and tests were conducted on the structure without and with tuned liquid dampers (TLD) on the roof of the structure to investigate the effect of TLD on seismic response of the structure. In the third stage, tests were conducted on bare frame structure under biaxial time histories with gradually increasing peak ground acceleration (PGA) till failure. The simulated earthquakes represented low, moderate and severe seismic ground motions. The effects of masonry infill panels on dynamic characteristics of the structure, effectiveness of TLD in reducing the seismic response of structure and the failure patterns of non-seismically detailed structures, are clearly brought out. Details of design and similitude are also discussed. Kriging surrogate model provides explicit functions to represent the relationships between the inputs and outputs of a linear or nonlinear system, which is a desirable advantage for response estimation and parameter identification in structural design and model updating problem. However, little research has been carried out in applying Kriging model to crack identification. In this work, a scheme for crack identification based on a Kriging surrogate model is proposed. A modified rectangular grid (MRG) is introduced to move some sample points lying on the boundary into the internal design region, which will provide more useful information for the construction of Kriging model. The initial Kriging model is then constructed by samples of varying crack parameters (locations and sizes) and their corresponding modal frequencies. For identifying crack parameters, a robust stochastic particle swarm optimization (SPSO) algorithm is used to find the global optimal solution beyond the constructed Kriging model. To improve the accuracy of surrogate model, the finite element (FE) analysis soft ANSYS is employed to deal with the re-meshing problem during surrogate model updating. Specially, a simple method for crack number identification is proposed by finding the maximum probability factor. Finally, numerical simulations and experimental research are performed to assess the effectiveness and noise immunity of this proposed scheme. The primary objective of this study was to identify concrete contribution to the initial shear strength of reinforced concrete (RC) hollow columns under lateral loading. Seven large-scale RC rectangular hollow column specimens were tested under monotonic or cyclic lateral loads. The most important design parameter was column length-to-depth aspect ratio ranging between 1.5 and 3.0, and the other test variables included web area ratio, hollow section ratio, and loading history. The tests showed that the initial shear strength reduced in a linear pattern as the column aspect ratio increased, and one specimen tested under cyclic loading achieved approximately 83% of the shear strength of the companion specimen under monotonic loading. Also, several pioneering shear models proposed around the world, all of which were mainly based on tests for columns with solid sections, were reviewed and compared with the test results of this study, for their possible applications to columns with hollow sections. After all, an empirical equation was proposed for concrete contribution to the initial shear strength of RC hollow columns based on fundamental mechanics and the test results. Differential Quadrature Method (DQM) is a powerful method which can be used to solve numerical problems in the analysis of structural and dynamical systems. In this study the governing equation which represents the free vibration of coupled shear walls is solved using the DQM method. A one-dimensional model has been used in this study. At the end of study various examples are presented to verify the accuracy of the method. Assessment of a monumental concrete arch bridge with a total length of 210 meters having three major spans of 30 meters and a height of 65 meters, which is located in an earthquake-prone region in southern part of the country is presented in this study. Three-dimensional finite element model of the bridge was generated using a commercially available general finite element analysis software and based on the outcomes of a series of in-depth acceleration measurements that were conducted on-site, the model was refined. By using the structural parameters obtained from the dynamic and the static tests, calibrated model of the bridge structure was obtained and this model was used for necessary calculations regarding structural assessment and evaluation. In order to analyze the experimental hysteretic behavior of the in-plane loaded reinforced grouted multi-ribbed aerated concrete blocks masonry walls (RGMACBMW), we have carried out the pseudo static testing on the six specimens of RGMACBMW. Based on the test results and shear failure characteristics, the shear force hysteretic curves and displacement envelope curves of the models were obtained and discussed. On the basis of the hysteretic curves a general skeleton curve of the shear force and displacement was formed. The restoring model was adopted to analyze the seismic behavior and earthquake response of RGMACBMW. The deformation capacity of the specimens was discussed, and the formulas for calculating the lateral stiffness of the walls at different loading stages were proposed as well. The average lateral displacement ductility factor of RGMACBMW calculated based on the test results was 3.16. This value illustrates that if the walls are appropriately designed, it can fully meet the seismic requirement of the structures. The quadri-linear restoring models of the walls degradation by the test results accurately reflect the hysteretic behaviors and skeleton curves of the masonry walls. The restoring model can be applied to the RGMACBMW structure in earthquake response analysis. Frame structures with viscoelastic (VE) dampers mounted on them are considered in this paper. It is the aim of this paper to compare the dynamic characteristics of frame structures with VE dampers when the dampers are modelled by means of different models. The classical rheological models, the model with the fractional order derivative, and the complex modulus model are used. A relatively large structure with VE dampers is considered in order to make the results of comparison more representative. The formulae for dissipation energy are derived. The finite element method is used to derive the equations of motion of the structure with dampers and such equations are written in terms of both physical and state-space variables. The solution to motion equations in the frequency domain is given and the dynamic properties of the structure with VE dampers are determined as a solution to the appropriately defined eigenvalue problem. Several conclusions concerning the applicability of a family of models of VE dampers are formulated on the basis of results of an extensive numerical analysis. Structural health monitoring systems are often installed on bridges to provide assessments of the need for structural maintenance and repair. Damage or deterioration may be detected by observation of changes in bridge characteristics evaluated from measured structural responses. However, construction materials such as concrete and steel cables exhibit certain time-dependent behaviour, which also results in changes in structural characteristics. If these are not accounted for properly, false alarms may arise. This paper proposes a systematic and efficient method to study the time-dependent effects on the dynamic properties of cable-stayed bridges. After establishing the finite element model of a cable-stayed bridge taking into account geometric nonlinearities and time-dependent behaviour, long-term time-dependent analysis is carried out by time integration. Then the dynamic properties of the bridge after a certain period can be obtained. The effects of time-dependent behaviour of construction materials on the dynamic properties of typical cable-stayed bridges are investigated in detail. 1. PRINT+e :	Print plus Free Access to the current online articles for the length of subscription until the subscription ends. 2. ONLINE+c :	Access to the current online articles plus Complimentary Access to the articles since the start of journal or as specified otherwise. The access to the articles of paid subscription period will be guaranteed after termination of subscription.